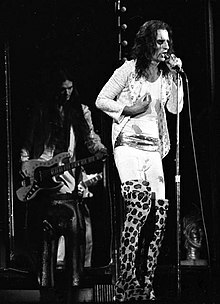 Dennis Dunaway (fødd 9. desember 1946) var bassgitarist for gruppa Alice Cooper frå 1969 til 1974. Han var medlåtskrivar på hittar som «I'm Eighteen» og «School's Out». Etter at gruppa Alice Cooper vart oppløyst, spelte han i 'Billion Dollar Babies' i lag med Michael Bruce, Mike Marconi, Dennis Dunaway, Bob Dolin og Neal Smith. Dennis spelte med Alice Cooper igjen på Welcome 2 My Nightmare som kom ut i 2011. Denne artikkelen bygger på «Dennis Dunaway» frå Wikipedia på engelsk, den 23. oktober 2011. ↑ Dan Haggerty (2010-02-05). «The Mosh Pit 2.05.10: The History Of Metal - 1971». 411 mania. Henta 23. okt. 2011. A group called Alice Cooper comprising Vincent Furnier on vokal and munnspel, Glen Buxton on lead gitar, Michael Bruce on rytmegitar and klaverinstrument, Dennis Dunaway on bass, and Neal Smith on trommer would get heir start in 1969 but would struggle until 1971 to enter the lexicon of rock and roll. And for the record Vincent would be the syngings real name, for a number of years he would be surprised when people would call him Alice simply because that was the name of the band. It wasn't until 1975, when he assumed control of the band as the only original member, that he would took the name for himself. ↑ Alex Parachini (1975-03-21). «Alice Cooper's image fading». Anchorage Daily News. Henta 23. okt. 2011. Denne sida vart sist endra den 12. mars 2013 kl. 19:04.